The Viplava Center for Neohumanist Studies and Action (Viplava Center) hosts and coordinates many of the activities and events of the Ananda Viplava Community. Viplava Center for Neohumanist Studies and Action empowers individuals seeking personal and social transformation. Our programs engender self healing, expansion of mind, universal love, community building, planetary action and service to all. All gatherings hosted by the Viplava Center are guided by the philosophy of Neohumanism, as propounded by Shrii P. R. Sarkar in 1982. The home of Viplava Center is an early 20th century farmhouse which has been renovated to provide a pleasant and comfortable space for friends and family to gather. 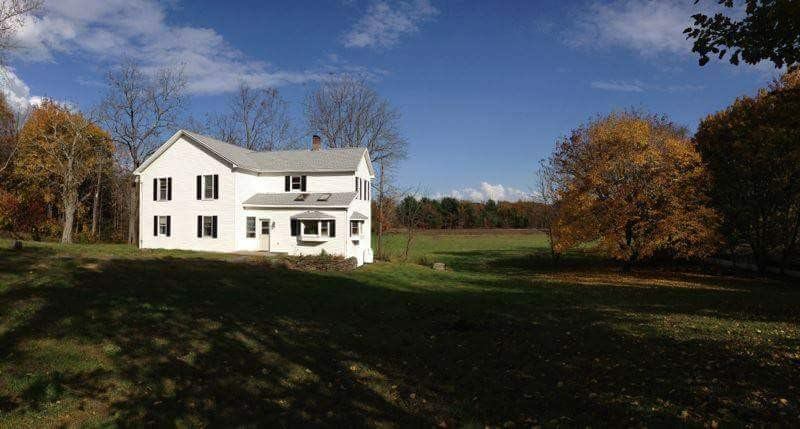 It is surrounded by 84 acres of lovely woods and wetlands in the foothills of the Catskill Mountains. Here you can walk on nature trails that will lead you to open fields with a mountain view, forests filled with wildflowers, creeks and even a small waterfall. In 2013 a Program Committee was formed to develop the Viplava Center and to plan future programs for Ananda Viplava. During the development phase family and friends have gathered and offered sample classes to each other. Other gatherings, held both on and off site, included yoga, meditation and kiirtan. Some gatherings had a specific focus group, such as beginner meditators, mens group or womens group. Additional similar gatherings continue to be planned. Work weekends, past and future, offer volunteers the opportunity to help with farming, construction, and beautification. The Farm project at Ananda Viplava also offers instruction in yoga and meditation for their volunteers. We are currently expanding the physical premises of the Viplava Center so that we may offer classes to the public. A two story barn is being renovated to become a commercial kitchen, dining hall, and 750 square foot teaching space. After its completion we will begin construction of the principal building which will contain approximately 13 dormitory rooms with private bathrooms, a spacious foyer, small meeting rooms, laundry facility, a deep meditation room, a children’s play area, and a state-of-the-art program-hall suitable for large meditation gatherings, yoga classes, dance, and professional theatrical and musical performances. Once the Viplava Center site is fully developed, we will offer quality programs to the public engendering self healing, expansion of mind, universal love, community building, planetary action and service to all. Acarya Viveka (Bruce McEwen), PhD, ERYT500, has practiced yoga and meditation daily since early 1972. Viveka’s training included intensive study in India which qualified him to give personal meditation instruction. Viveka has taught yoga and meditation classes continuously since 1997 and has organized and led numerous weekend yoga retreats. Viveka is a co-founder and faculty member of Ananda Marga Yoga Teacher Training, a Yoga Alliance accredited program that has trained over 150 yoga teachers. More recently he has completed a 300 hour training in “Therapeutic Yoga” with Kaoverii Weber, director of Subtle Yoga Training Institute. Drawing on his professional background as a research scientist with the New York State Department of Health and a faculty member of SUNY- Albany, Viveka takes a rational yet compassionate and loving approach to the spiritual science of yoga. One of Viveka’s main interests is helping people to manage stress and avoid becoming overwhelmed with anxiety or depression. Acarya Devanistha (Jody Wright) teaches meditation and offers guidance to aspirants looking for a personal spiritual practice. She is a mother of five grown children, and a parent educator with a specialty in infant massage, adoption and breastfeeding. She has been an active student of Prout (Progressive Utilization Theory propounded by P. R. Sarkar) for many years - and works for social change in many areas of our society. Currently she serves on the Women Proutists Board in North America, and is the graphic designer for their Rising Sun newsletter. She lives in Massachusetts, travels extensively world-wide, and visits Ananda Viplava as often as she can.